"When we began our Treasure Auctions two years ago, we had no idea how quickly the concept would grow. Just compare our first sale of around 400 lots to almost 1800 lots now, more than a fourfold increase!" This is also Sedwick’s first auction to offer live Internet bidding via iCollector.com. "While we hope to offer fully live auctions in person some day, we feel we offer the next best thing with live bidding on the Internet combined with full descriptions and photos, both in this catalog and on our website, and our long-standing reputation for accuracy and fairness," says Sedwick. This latest auction features extreme-size coins, from immense Swedish copper "plate money" to tiny silver cuartillos (¼ reales) from Spanish colonial mints, literally hundreds of which appear in this sale from a collection of "mini-coins" assembled over the course of 40 years. Also featured is what the catalogers believe to be the largest Potosí cob 8 reales ("Great Module") ever made. Even the shipwreck bullion section offers the extremes of huge silver and copper ingots and to tiny flakes of gold dust and nuggets. Sedwick’s primary area of concentration, Spanish colonial cobs, is well represented this time by a collection of mostly 8 reales. Among the usual shipwreck-coin lots (another Sedwick specialty) is a unique presentation-strike 8 reales from the unauthorized "Star of Lima" series of 1659 recovered from the "Jupiter wreck" off Florida. Several shipwreck Mexican pillar dollars from the first dates of 1732 and 1733 are also on offer. Sedwick’s other major niche, shipwreck and treasure-related artifacts, is augmented this time with two important collections: The Art McKee Collection of 1733-Fleet (and other) artifacts from his Sunken Treasure Museum on Plantation Key, Florida; and finds from a Spanish Colonial site of ca. 1590 in the southern Caribbean. 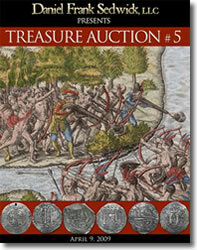 Treasure Auction #5 also contains an expanded World Silver Coins section, with significant collections in Guatemala, Mexican War for Independence, Nicaragua/Honduras provisional issues and more. The colonial sections of Bolivia and Peru contain numerous bust 8 reales from fresh hoards found in Peru. For the first time Sedwick is offering a variety of paper money and maps, as well as medals and decorations. At the end is a continuation of the Tom Sebring Treasure Library of books relating to shipwrecks and treasure. For catalog or more information, please contact Sedwick at info@sedwickcoins.com or log onto www.sedwickcoins.com. Daniel Frank Sedwick, LLC is the world’s premier specialist in the colonial coinage of Spanish America, shipwreck coins and artifacts of all nations. In addition to an Online Store, Daniel Frank Sedwick, LLC sell coins and artifacts at various numismatic shows around the nation. Daniel Frank Sedwick, LLC also has the honor of being the only auction company in the world specializing in Authentic Treasure! Auction catalogs are accessible on the web and printed in a high-quality format with full-color illustrations for all lots. In addition to publishing several catalogs per year, Daniel Frank Sedwick is a regular vendor at major international coin shows, including FUN, CICF, and ANA. Until early 1996, Mr. Sedwick worked in partnership with the late Dr. Frank Sedwick, who began the business in 1981 and became known as a pioneer in the field of Spanish colonial numismatics with his book, The Practical Book of Cobs. The fourth (2007) and third (1995) editions of this well-known book were authored and co-authored by Daniel Sedwick, who is also a contributing editor to The Numismatist (the monthly magazine of the American Numismatic Association) and the author of several articles.